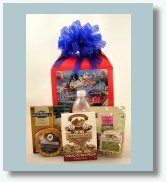 Hotel & Travel Amenities, great for Corporate and Convention Gifts. and special guests to San Diego. 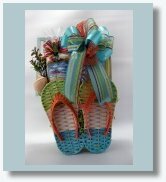 If you love the beach, you'll love our flip flop wired basket. Surf's up! A tote with it own flatware filled with healthy food to be enjoyed during travel, at school and at the office. 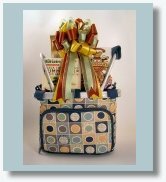 A great gift for convention gatherings, special meetings and events, filled with delicious food. A San Diego post card is included. 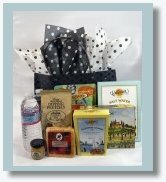 California themed gift box loaded with tasty snacks for hungry vacationers and keynote speakers. If you adore flamingos and going to the beach, this goodie box is taylor made for you! 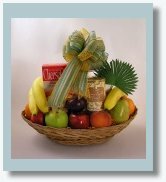 This fresh fruit basket is loaded with hand selected seasonal fruit. You may also add gourmet snacks! A gorgeous trunk with an old world map design is amply filled with sweet and savory delights. 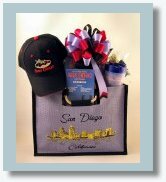 Treats for your visitors to share and San Diego trinkets to keep, including regional maps, San Diego caps and more. 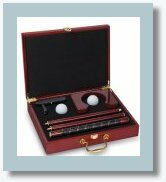 Right handed four-piece travel putter with wooden shaft, practice cup and two golf balls for indoor fun. Welcome your guest to San Diego! Have something else in mind? No problem! 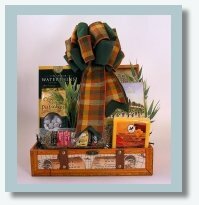 Custom create your gift within your budget. "OMG, Thank you!! I got the basket, and it's so wonderful! I can't wait to see who wins it."